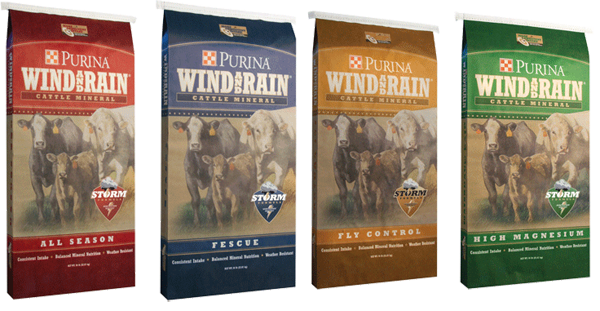 -Use Purina’s Wind and Rain® Fly Control Minerals. They are designed to reduce fly populations. 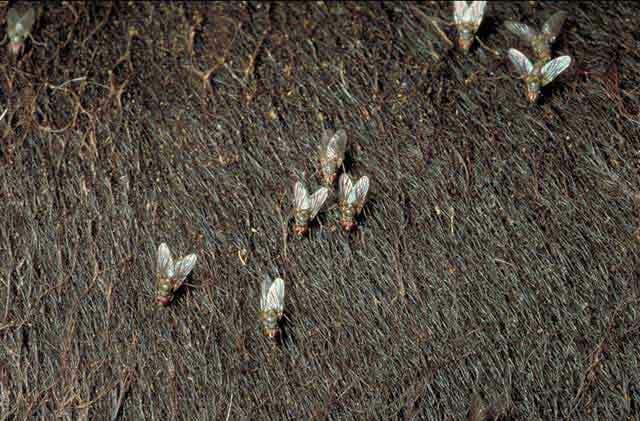 Flies cause significant discomfort for cattle. As part of an integrated fly control program, Purina’s Wind and Rain with Altosid (MTH), helps restore cattle comfort while reducing factors that cause poor performance, and decreased grazing time. Purina’s Wind & Rain Fly Control Minerals work best if they are fed in spring prior to the appearance of flies and continued until cold weather restricts fly activity in late fall. Ark Country Store offers the following selection of products to help with fly control. 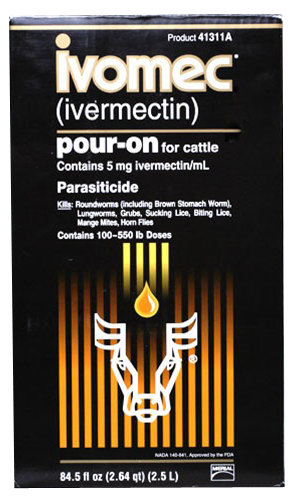 IVOMEC (ivermectin) Pour-On for Cattle – delivers internal and external parasite control in one convenient low-volume application. Discovered and developed by scientists from Merck Research Laboratories, IVOMEC Pour-On contains ivermectin, a unique chemical entity. 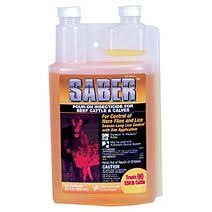 SABER Pour-On for Cattle – for long-lasting residual control of lice and horn flies on beef cattle and calves. A broad spectrum pest management insecticide to control horn flies and lice. 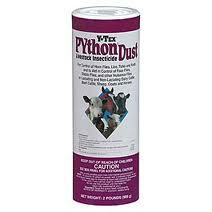 Python Dust Shaker Can – for the control of horn flies, lice, ticks, and keds on lactating and non-lactating dairy cattle, beef cattle, sheep, goats, and horses. Apply Up to 2Oz of Dust Per Animal Evenly Into the Hair Over the Head, Ears, Neck, Shoulders, Back, and Tailhead. 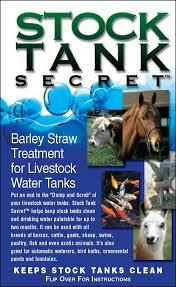 Stock Tank Secret – Barley straw treatment for livestock water tanks, this product is easy to use and effective in keeping livestock water tanks clean and drinking water palatable for up to two months. The little-known “secret” is barley straw, which has been used for decades in England as a water treatment. Purina Wind & Rain C attle Mineral Supplements – a highly sought after line of cattle mineral supplements – All Season, High Magnesium, Fescue and Fly Control. These minerals are designed to give your cattle the nutrients they need to help with challenges such as grass tetany, reproduction, and much more. This entry was posted on Wednesday, March 27th, 2019 at 6:59 pm	and is filed under News & Updates. You can follow any responses to this entry through the RSS 2.0 feed. Both comments and pings are currently closed.